Christmas laser tag combat parties – blazing good fun for your team! Are you looking for an exciting, memorable and great value activity for your Xmas Party? 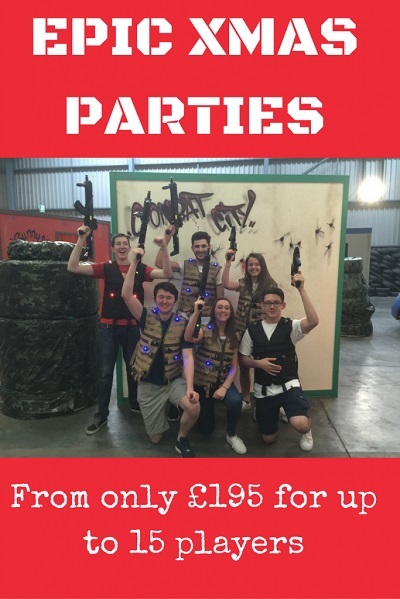 You can book an exclusive Combat City tactical laser tag battles at Cambuslang and Dundee from only £13pp. Perfect for office parties, sports teams, social clubs and groups of friends. Enjoy the exhilaration of working as a team to achieve your mission – it’s just like playing ‘Call of Duty’ for real. Your 90 minute package, including approx. 60 minutes in the arena playing 4 missions is only £195 for up to 15 players at Dundee, and £225 at Cambuslang. Additional players are only £13 or £15pp, and parties of up to 60 players can be accommodated. Great value pizza buffets are available, and if you are looking for a unique multi-activity event you can book a indoor karting competition at ScotKart as well, which shares the same building.